Love him or hate him, there's no way to be inattentive to golf writer Dan Jenkins. Jenkins has been following the trials and tribulations on the fairways and greens for nearly sixty years. Regardless of one's appreciation of his body of work – books include Dead Solid Perfect, Semi-Tough, and most recently The Franchise Babe - that longevity alone should earn the reader's respect. Whether or not he “invented the art of golf writing” as claimed by John Feinstein on the jacket is another discussion. 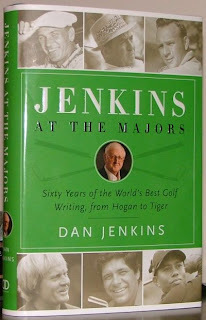 Jenkins' latest volume is Jenkins at the Majors: Sixty years of the World's best golf writing, from Hogan to Tiger. It is collection and re-editing of his essays and press room work from 1951 to 2008. The bottom line on this book is quite simple: If you are a golf fan and have even the slightest interest in the history of the game, you need to read Jenkins at the Majors. It is a massive history lesson presented with the Jenkins' flavor. It is a time travel odyssey from Ben Hogan's victory in 1951 U.S. Open to Tiger Woods' win at the 2008 U.S. Open with 92 other layovers along the way. Unfortunately these 94 majors are less than half of the number (198) that Jenkins has covered. The history aspect here is important. Whether we care to admit it or not, we are all to some degree interested in the history of the game. It may not reach back fifty or sixty years, but every golfer knows who Tiger Woods is. Our knowledge of the history of the game can always be improved and there is no substitute for getting it first hand. And that's what makes this book so entertaining – a colorful history lesson from someone who has been there.